A rare early 19th century Rosewood Side Table of the Lesser Antilles. This beautiful colonial side table having a moulded top with 2 drawers and retaining the original tuned knob handles, the whole raised on a tapered reeded leg. 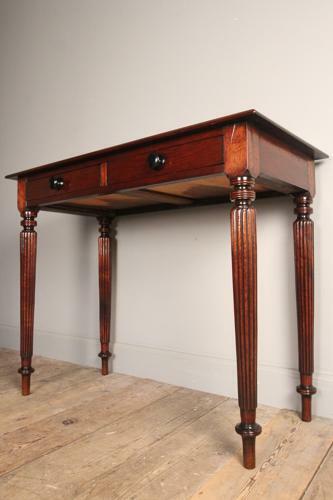 This well proportioned table is in lovely original condition, made in solid dense rosewood. Firm standing sturdy heavy table. Circa 1820. Dimensions: Height: 75.5 cm (29 3/4 Inches), Width: 94.75 cm (37 1/4 Inches) Depth: 45.75 cm (18 Inches).